Sports nutrition refers to the practice and study of both diet and nutrition in relation to athletic performance. It is mainly composed of guidelines relating to proper nutrition to further improve the performance and efficiency of athletes. Sports nutrition is also more concerned about finding the right quantity and type of food and fluids that should be taken by athletes while also dealing with proper nutrition by increasing the intake of foods and drinks that are rich in vitamins, minerals and vital organic substances including proteins, healthy fats and carbohydrates. Despite the fact that sports nutrition forms a huge part of numerous sports training routines, it is mainly used in strength sports and endurance sports. Sports nutrition performs a wide array of functions. These include preparing athletes before training or performance, maintaining the most acceptable performance level during training or competition, allowing the bodies of athletes to fully recover after a rigorous training or competition, providing relevant information associated to the healthiest dietary practices that are perfect for athletes as well as the proper use of sports supplements, monitoring the condition of athletes to determine if they show signs of supplement abuse, doping, eating disorder or any other unhealthy practice, offering a more specialized nutrition solutions and advises to athletes and keeping track of the nutrition needs of individuals with disabilities who take part in numerous athletic programs and activities. If you want to become a certified sports nutritionist, then you have to become familiar about how to perform all those functions. Another major component of the reliable and popular platinum personal trainer certification program offered by Brainmeasures is the sports nutrition certification course. The platinum personal trainer online certification course is popular for containing a dozen of vital courses that are extremely relevant to achieving a better physical health, fitness and nutrition. But since the package consists of individual courses, you are given the choice to take up the sports nutrition course alone if generating a more comprehensive knowledge about the sports nutrition field is only your sole aim. With the help of this certification course, you will get a certificate which will allow you to start providing your expert knowledge and skills about sports nutrition to athletes. 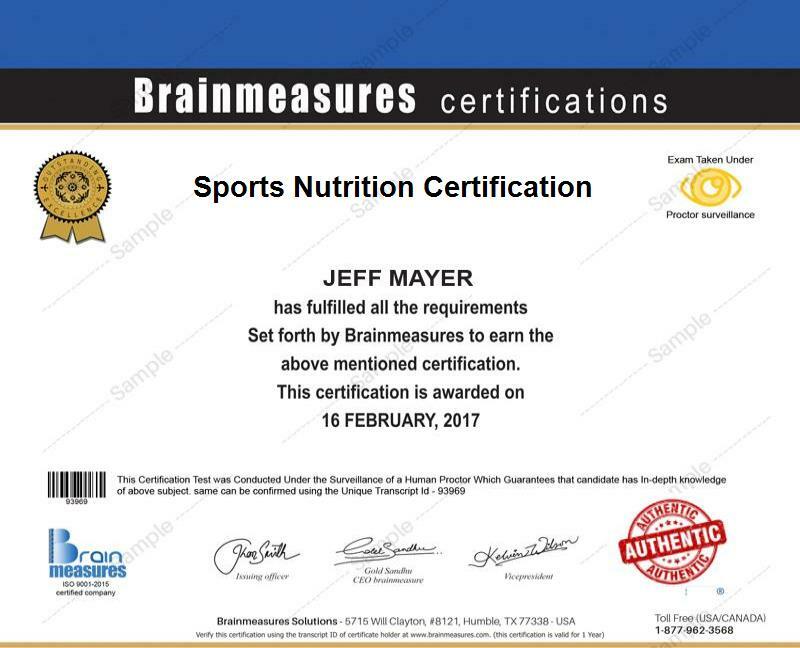 But before you will receive your sports nutrition certification, Brainmeasures will assess the level of your skills, expertise and knowledge in the field through its professionally and expertly developed sports nutrition test. This fitness training exam is one of the most accurate and reliable exams offered by Brainmeasures so expect to become a real expert in the field of sports nutrition after you pass it. The sports nutrition certification program which you can now access at Brainmeasures can help you receive high quality information related to sports nutrition. This is the most suitable certification course for you if you are an aspiring or existing strength trainer, personal trainer, group fitness instructor and health enthusiast or practitioner who wants to focus more on providing the best sports nutrition services and advises to athletes. The sports nutrition certification course is also ideal for athletes who want to make sure that they know exactly how to use sports nutrition in further improving their performance in their chosen sport. Holding a sports nutrition certification can be very profitable for you. Considering the hundreds of athletes who are in search of the most reliable sports nutritionist at present, it is greatly possible for you to receive good offers in terms of salary. At present, sports nutrition certification holders who are still starting out their career in the field can earn around $29,000 to $41,000 per year. After five years of experience, this amount can grow to $31,000 to $50,000 annually. Sports nutrition certification holders who have worked in the industry for more than twenty years already can earn between $46,000 and $86,000 per year. This can grow even more after you receive a master’s degree in the field.